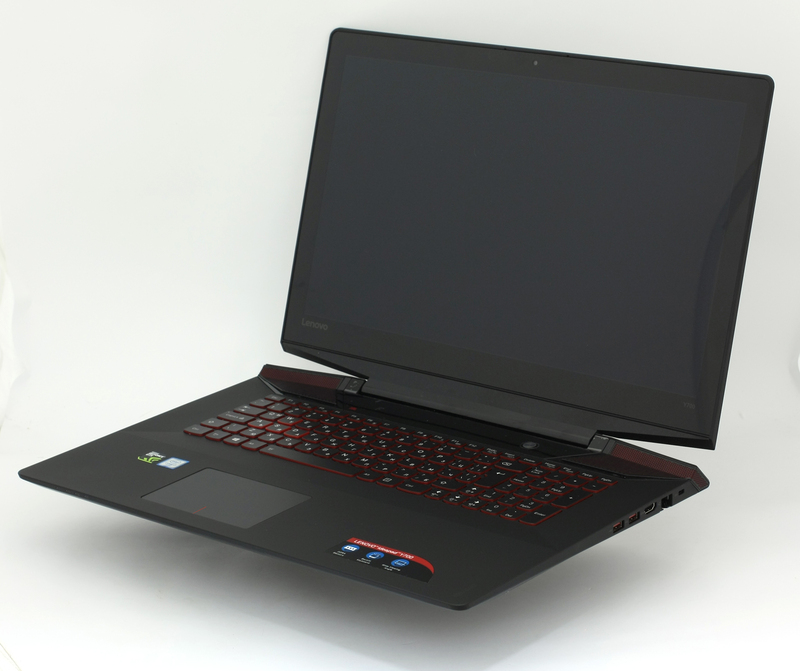 With the growing popularity of mid-range gaming notebooks we started reviewing even the 17-inch versions of the mainstream 15-inchers despite the fact that most of the hardware, performance and design is practically the same. However, our recent finds on the Acer Aspire V17 Nitro Black Edition and ASUS ROG GL752VW show that there is more than it meets the eye. Manufacturers change the panels, obviously, and even sometimes we experience slightly different overall user experience. Also, the cooling system of the 17-inch form factor should be noticeably better due to the extra headroom for the hardware. 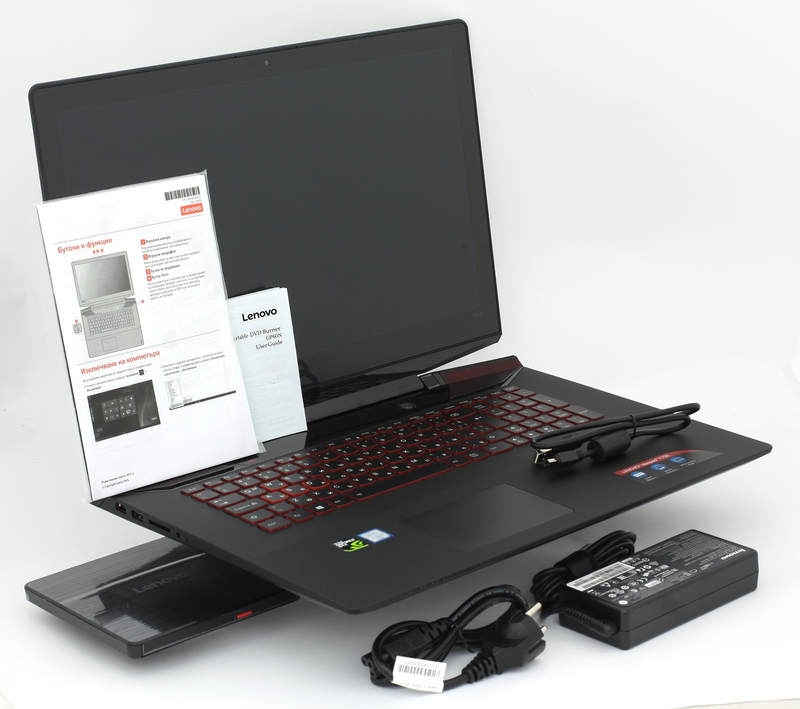 A subject of our review is Lenovo’s Y700 (17″) – months after we published the review of the 15-inch variant. 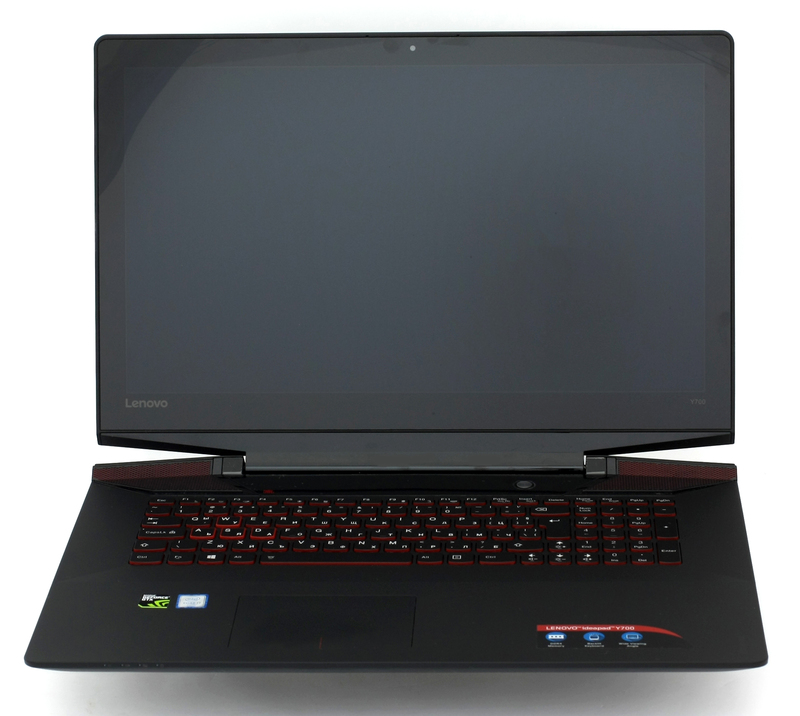 We were somehow disappointed by the screen quality and the cooling system so now, we have the chance to see if the Y700 (17″) will right the wrongs of its 15-inch sibling like the V17 Nitro Black Edition did with its smaller counterpart. The same cannot be said, however, for the ASUS ROG GL752VW as the 17-inch variant sports a lackluster TN panel and much shorter battery runtimes. Let’s see if the 17-inch Y700 will hold up better in our tests compare to the 15-inch model or will it be the other way around. The 17-inch version came with a much bigger box containing all the usual user manuals, DVD with drivers, AC charger, power cord and the notebook itself. And since the notebook doesn’t have an optical drive, an external unit is included in the package. It’s just a bigger version of the standard model and we don’t mean that in a bad way. The new design offers overall better feel, build quality and aggressive looks while keeping the same design language. For starters, the lid is made of the same black, brushed aluminum, which is a huge fingerprint magnet but also easy to clean and sturdy as hell. Even if you press the lid really hard, you will hardly notice any deformation. 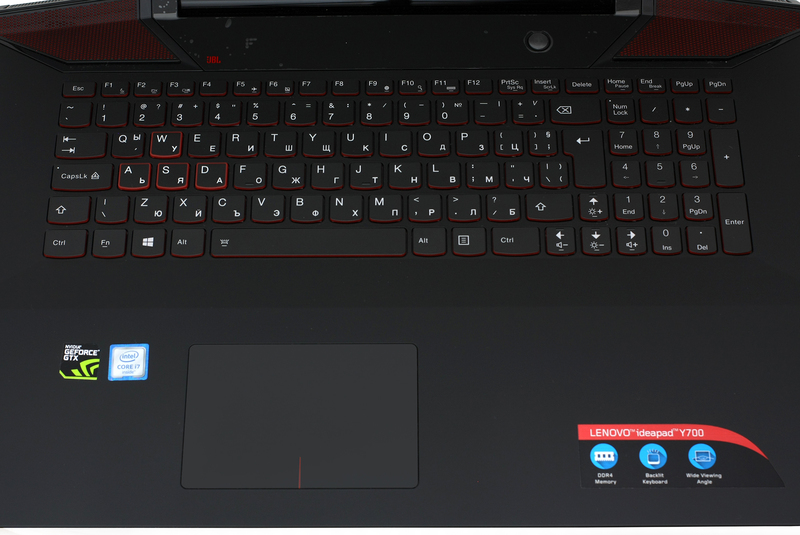 This might be due to the extra thickness they’ve added this year on the Y700’s lid and, of course, to support the hefty screen, Lenovo has put a single wide hinge, which is pretty tightly pulled, flexing the screen is impossible and so is opening the laptop with one hand. We would like to make a quick note here about the screen bezels, which appear to be a bit thinner than before, but we still feel a bit distracted by the bottom one – it takes a good chunk of the surface. The bottom features the same brushed aluminum finish with a big vent opening accompanied by a thin layer of something that looks like “dust shield”. It’s effective at first – it keeps the dust away from the fans – but dust builds up over time and will likely cause some cooling issues. When you see the dust building up, just remove it and let the notebook “breathe”. 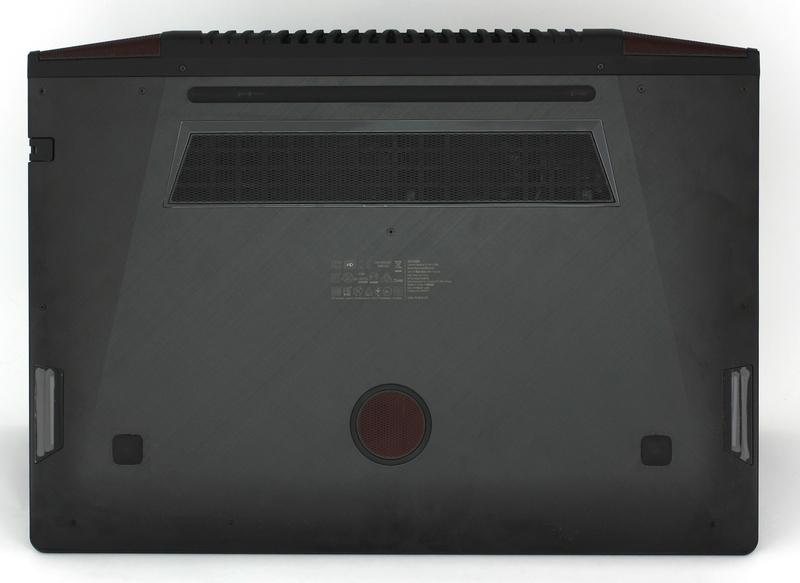 Along with the vent, you will notice the iconic subwoofer, which the Y series notebooks have offered for a few generations now. The height of the machine has grown a bit, compared to last year’s Y70, but with just around 2 mm so it’s actually barely noticeable (25.9 mm for the Y70 and 27.95 mm for the Y700). There’s, however, one thing that hasn’t changed compared to the last generation – connectivity options. Unfortunately, the Y700 offers the same amount of ports as the Y70 and the Y700 (15″) and again no USB-C port included. 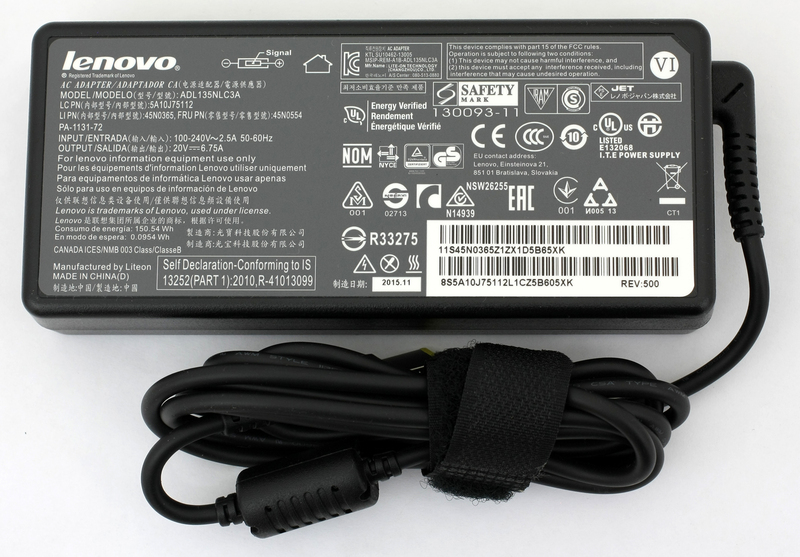 It still features the “healthy” port distribution with the DC connector, USB 2.0, SD card reader and the 3.5 mm audio jack on the left while the right holds the two USB 3.0 connectors, LAN and HDMI. 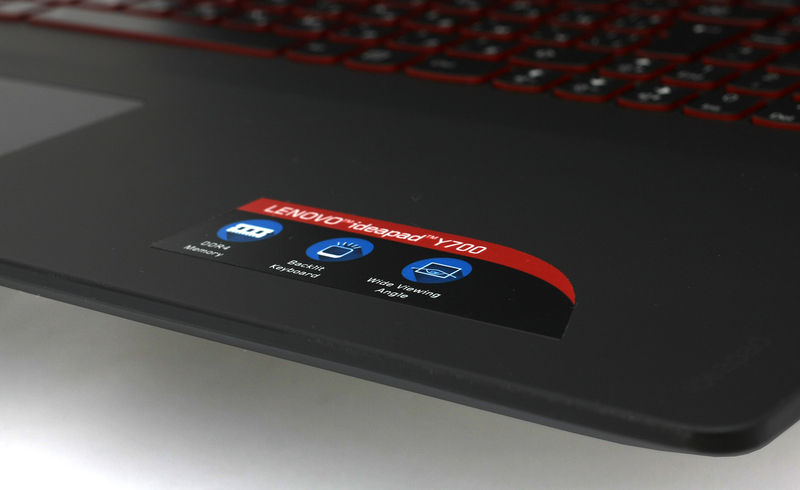 Unlike the Y70, the Y700’s edges aren’t sharp and connect perfectly with the aluminum bottom plate without resulting in any unnecessary gaps. Something we didn’t quite like in the Y50 and Y70. The interior is absolutely the same as the one we saw in the Y700 but with bigger palm rest area. 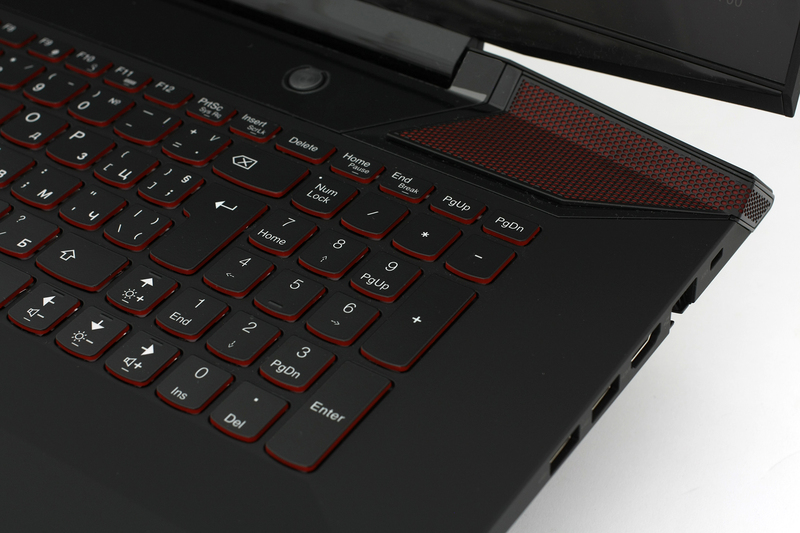 The red speaker grills and the power button remain untouched along with the keyboard design and ergonomics. The keys feel good with just enough key travel. Yet, media player buttons are still out of the picture and the touchpad performance is once again sub-par. Navigating the cursor is okay but some gestures like swiping, scrolling and double-finger presses for right mouse click are often inaccurate. The same applies for the clicking – often pressing the touchpad will register a right click button instead of left. It’s quite frustrating at times and it seems that the touchpad driver is the one to blame here. The same issue occurred with the Y50 and Y70 and it doesn’t seem to be resolved in the newer Y700 version, unfortunately. 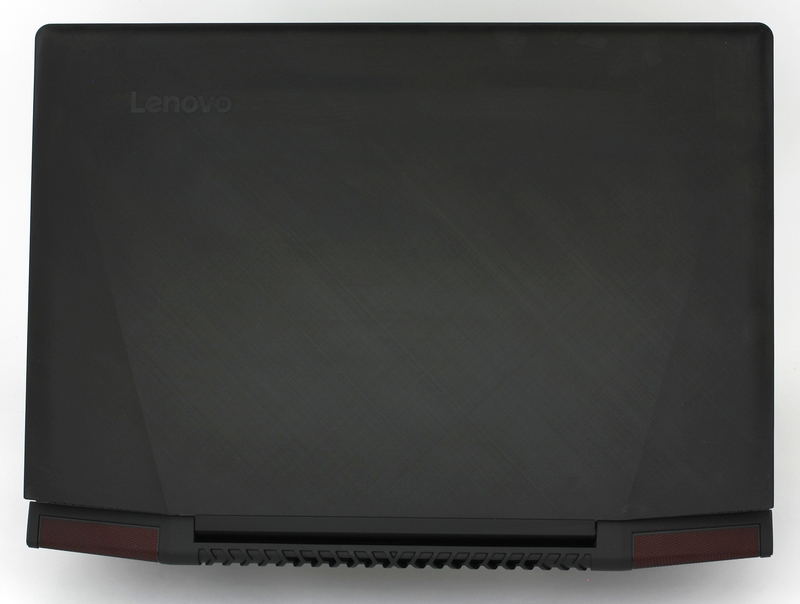 The Lenovo Y700’s display uses an LG-made panel with model number LP173WF4-SPF1, which is also found in the Full HD version of Acer’s Predator 17 laptop The AH-IPS panel sports a Full HD (1920×1080) resolution, 127 ppi and pixel pitch of 0.1995 x 0.1995 mm. The screen can be considered as “Retina” when viewed from a distance equal or greater than 69 cm. And here’s the image quality with tilted screen under 45-degree angle. We’ve recorded slightly higher maximum brightness compared to the Acer Predator 17, more accurate color reproduction and closer to optimal color temperature. The maximum brightness in the middle of the display is 350 cd/m2 and the average is 342 cd/m2 with just -6% deviation. Color temperature is 6230K in the center while the average is again 6230K which is slightly warmer than the optimal 6500K but still fairly unnoticeable. The maximum color deviation is also pretty low with only 1.7 dE2000 in the upper-right corner. Deviations above 4.0 are undesirable. 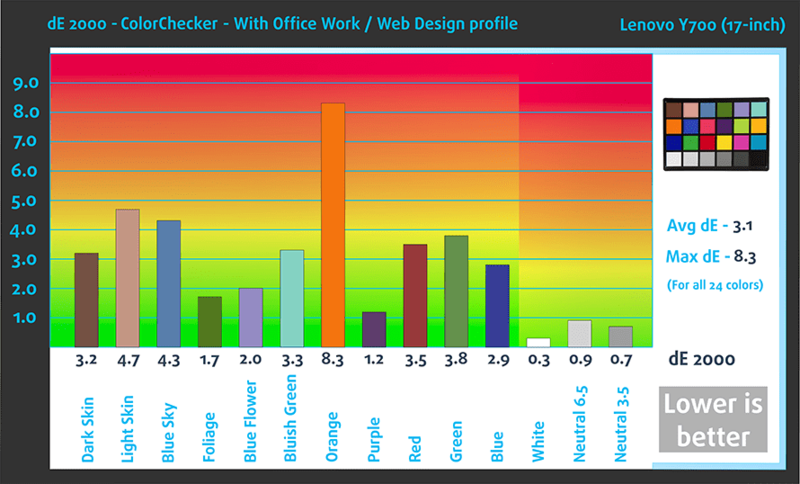 Here’s how the screen scored at 140 cd/m2 or 74% luminance. Here’s a shot of the screen without any external light. You can see some slight light “bleeding” in the lower-right and lower-left corner, although the latter is barely noticeable. We’ve also included the so-called Pointer Gamut by Michael Pointer, which represents colors commonly found in nature and perceived by the human eye. The rectangular represents the gamut coverage of the display which is 89% of the sRGB and 76% of the Adobe RGB. Colors will appear fairly saturated and will be enough for the usual web browsing, multimedia and gaming. Below you will see practically the same image but with color circles representing the reference colors and white circles being the result. You can see main and additional colors with 25%, 50%, 75% and 100% saturation inside the sRGB gamut. We’ve created a pre-calibrated profile with 140 cd/m2 screen brightness and D65 (6500K) white point. The contrast ratio is excellent before and after calibration – 1100:1 and 1050:1, respectively. We’ve also measured how good the display is able to reproduce really dark parts of an image. It’s essential when watching movies or playing games. The left side of the image represents the display with stock settings while the right one with our custom profile for gaming and multimedia. On the horizontal axis, you will find the grayscale and on the vertical axis the luminance of the display. An essential part of the near black scale right next to pitch black, which is 0.09% out of 140 cd/m2 or 0.13 cd/m2. After we’ve installed the profile, the visibility is much better. We illustrate the first five levels of the gray (1%-5% white), right after black level, using the five boxes on the image below. 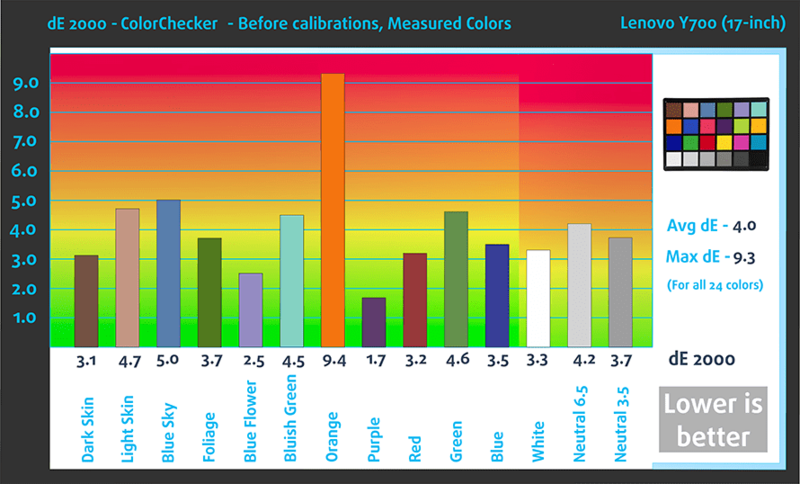 Keep in mind that whether you can distinguish them or not strongly depends on the settings of your current display, the calibration, the viewing angle and the surrounding light conditions. If you happen to own the Y700 (17-inch), you can go back to this page when you’ve installed our gaming profile to see the difference. Fall Time + Rise Time = 27 ms. Unlike its 15-inch sibling, the Y700 (17″)’s display doesn’t use PWM across all brightness levels. The absence of PWM is probably inherited from the integration of the LP173WF4-SPF1 panel, also found in the Acer Predator 17 (FHD version). The Y700 (17″) appears to have superior display to the 15-inch Y700 by offering larger sRGB coverage, brighter panel, more accurate color reproduction, better contrast and no PWM across all brightness levels. Basically, the 17-inch Y700’s display is better in pretty much every aspect. It’s also pretty strong against its competition like the Acer Aspire V17 Nitro Black Edition and way better than the ASUS ROG GL752VW. There are slight inconsistencies, though, but can be fixed by installing our custom-made profile for gaming and multimedia. We are referring to the lower visibility in the so-called near black areas. Again, we are presented with excellent sound quality with rich and full sound without any major distortions. The added subwoofer on the bottom adds to the already good sound quality. The specs below may not apply to your region. We used a freshly installed Windows 10 (64-bit) for our testing and if you want to perform a clean install as well, we suggest downloading the latest drivers from Lenovo’s official support page. The 17-inch Y700 retains the same 4-cell 60Wh battery unit providing slightly better battery performance than the 15-inch version against all odds. Although, we are mostly certain that the difference in results is due to the use of an engineering sample at the time of publishing the Y700 15-inch review. Anyway, we are quite pleased with the results as they are considerably higher than other notebooks in this class. All tests are run under the same conditions as always: Wi-Fi turned on, battery saving feature turned on and screen brightness set to 120 cd/m2. Great battery performance here – 390 minutes (6 hours and 30 minutes). Another excellent runtime – 356 minutes (5 hours and 56 minutes). As expected, the gaming test took a toll on the battery with only 125 minutes (2 hours and 5 minutes) of play time. Fritz is a chess benchmark that tests the computing capabilities of the CPU with various chess moves. The Intel Core i7-6700HQ managed 12.484 million moves per second. By comparison, one of the most powerful PCs, Deep(er) Blue, was able to squeeze out 200 million moves per second. In 1997 Deep(er) Blue even beat the famous Garry Kasparov with 3.5 to 2.5. The two-staged test isn’t exactly a representation of a real-life usage but it gives us a good grasp of what the cooling system is capable of and the stability of the notebook in the long run as a whole. 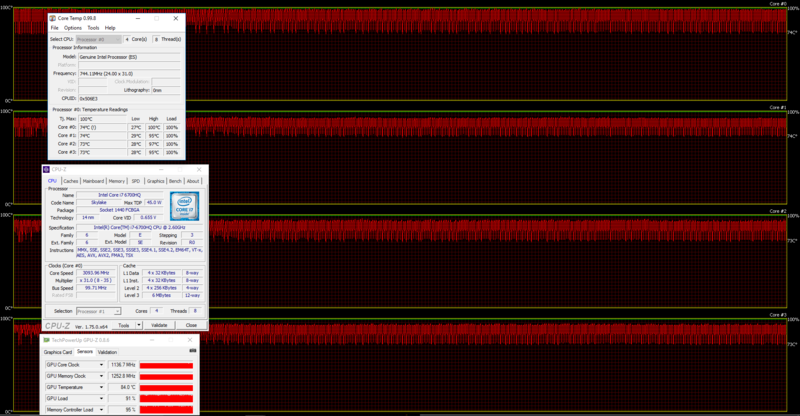 At first, things seemed normal with only one CPU stress test running in background. The silicon’s temperatures were stable at 75 °C while clock speeds were the maximum 3.1 GHz for four active cores. 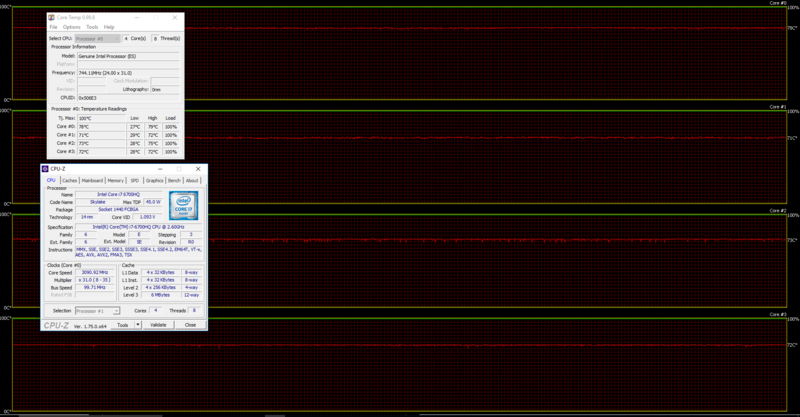 The red line on the graph below represents CPU temperatures while the green one stands for CPU load. Unfortunately, we observed the same problem as on the 15-inch model regarding CPU thermal throttling. In order to maintain safe operating temperatures after switching on the GPU stress test, the CPU’s frequency was all over the place between 3.1 GHz and 700 MHz. Also, temperatures were 97 °C for the CPU and 84 °C for the GPU – both of which are really high. At least the GPU was able to maintain maximum operating frequencies and no throttling occurred. We were somehow optimistic about the cooling system because of the extra breathing room the 17-inch version offers over the 15-inch variant. However, the heat on the surface was as high as before reaching as high as 48 °C making it a bit uncomfortable to use during long gaming sessions. Though, the palm rest area remained relatively cool. However, the display on this machine is more than we expected. It surpasses its 15-inch sibling by a mile while wiping the floor with the affordable ASUS ROG GL752VW and going head to head with the near perfect Acer Aspire V17 Nitro Black Edition‘s screen. The same goes for the battery life because it’s probably one of the best we’ve measured on a 17-inch gaming laptop. Yet, we are still unsatisfied with the cooling system because, during our tests, the notebook reached substantially high temperatures, caused CPU throttling and the right side of the keyboard was noticeably hot. 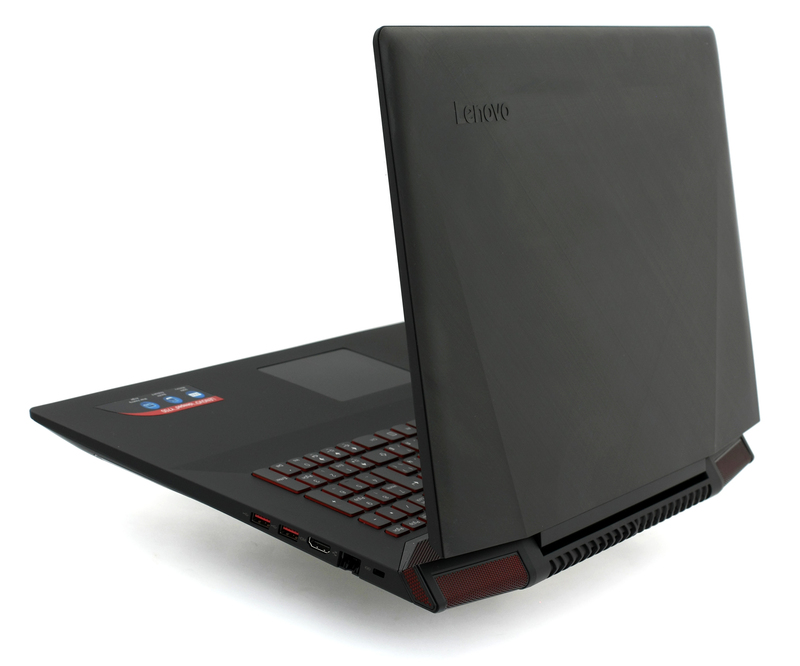 So in terms of cooling design, the Y700 drags behind its competitors while excelling at the above-mentioned areas. Does it have m2 nvme support ? Unfortunately, i found only for 17″.